So let's assume for one moment that you are an international corporate executive responsible for your company's emerging market strategy. You are hearing a lot more about Africa of late, and feel strongly that your organisation needs a well-researched and informed strategy on a continent that has for so long evaded your radar. Be careful though how much store you place on stock wisdom about Africa packaged as authoritative. You may find that such commentary does not always enlighten, so that, in a paradoxical sort of way, the more you read the less truly educated you become. Before you begin to ponder what avenues may be available to your company as it seeks to escape this information trap, let me illustrate what I mean with a classic example. There is a near-universal belief that Africa is the richest continent on Earth from a natural resource point of view. This belief is most strongly associated with mineral wealth, which is the form of natural resource endowment easiest to measure. In what has become the accepted narrative, Africa is poor both because of and in spite of its fabulous mineral wealth. The logical implication of such a view is clearly then that Africa has to do little more than just chuck out "its greedy dictators" and/or "incompetent governments", for its natural endowments to translate into economic and financial wealth. Obvious enough. But is Africa that super-endowed? Even economic analysts who have covered Africa for a great many years are sometimes tripped by simple questions like: which country is the world's largest producer of gold? Many of them rush to say South Africa, and are puzzled when they learn that it is indeed China. The impression has been so often created that China, like much of Asia, have developed economically "despite" great natural resource poverty, when the truth is that countries like China, Indonesia, India, Malaysia and the Philippines are indeed amongst the world's most wealthy nations from a natural resource point of view. Indeed, many analysts are often surprised to learn that South Africa is fourth down the list of major gold producers and may soon be overtaken by Russia and Peru, if its remarkable decline continues unabated. The same confusion registers on the faces of even supposedly well-informed observers when they learn that comparing energy resource management models in the OECD to those in Africa can be very misguided because of the huge gaps in resource per capita levels. The most famous illustration of this situation is the belaboured 'Norwegian model'. When the point is explained that Norway, according to the World Bank, has less than one-thirtieth of Nigeria's population and yet (according to the International Energy Agency) produces roughly the same amount of oil as the latter. Let me illustrate what this means in clearer economic terms. At May 2012 benchmark prices, each Nigerian would receive $460 if the country's annual oil output was shared equally. The average Norwegian, would, on the other hand, receive $15,000 under the same method of distribution. I need not add that if oil was the only thing both countries produced, and there was zero mismanagement in either country, Norway would still be a much wealthier country today than Nigeria. This analysis remains valid even after you account for production and related oil industry costs. The point of the selected illustrations above is to underscore the lack of perspective that usually attends the evaluation of Africa's natural resource endowment in a global context. To strengthen the point, one needs to conduct a more comprehensive and in-depth analysis. So I have intermittently, under the aegis of a think tank I am affiliated with (www.imanighana.org), been poring over geological survey data from some of the world's leading depositories, especially the British and US geological Surveys. I have also looked at secondary analysis of mineralogical datasets held by local agencies in Africa, in such countries as Ghana, Nigeria and Tanzania. The results are breath-taking. Both on a per-square mile and a per capita basis, Africa lags behind the global average in mineral production and reserves. Of a hundred minerals considered highly important to industrial production, Africa features strongly in only about ten. Africa is the richest continent in the world, in terms of its natural and mineral resources...Africa supplies up to 31 percent of the world's demand for bauxite, cobalt, gold, manganese, phosphate and uranium. Additionally, it supplies 57 percent of the world's need for chromium and diamonds, and the hydrocarbon deposits are immense [the continent produces 12 percent of the world's oil and has about 8 percent of reserves]. The African Union Chief in June 2010, who made the above statement, mentions 9 of the minerals produced in significant quantities in Africa. To round off the list, platinum should have been added. There are, however, a number of filters one can pass this type of information through. Firstly, with the exception of bauxite and petroleum, these minerals are not as widely used in industry (or in the same considerable volumes) as a number other minerals, such as tin, copper, nickel, zinc, iron, coal, and lead, that Africa does not produce in sufficient quantities. Indeed, of the top 5 metallic minerals which constitute 62 percent of the total value of global production, Africa is only a significant producer of one of them: gold. Africa has 8 percent of the world's copper, 4 percent of aluminium, 3 percent of its iron ore, 2 percent of lead, less than 1 percent of zinc, and virtually no tin or nickel. To put these figures into perspective, recall that Africa has about 14.5 percent of the world's population. The case of bauxite (which is processed into aluminium) is interesting. Guinea, which ranks fifth worldwide, is the only significant producer among the world's top 15 countries, producing 18 million tons per annum, compared to Australia's 70 million. Guinea does hold the world's largest estimated reserves of bauxite (7.2 billion tons), with Australia closely following (6.2 billion tons). This fact brings the other filter into play: reserves or untapped mineral deposits and their distribution across Africa. Of those few minerals that Africa is believed to hold globally significant or dominant reserves, nearly all of them are concentrated in 4 countries: South Africa, Angola, Democratic Republic of Congo and Guinea. When one computes the level of inequality of mineral distribution across different continental regions, Africa pulls up strongly, showing a far higher than average level of distribution 'imbalance' per capita or square mile. In very simple terms, it means that mineral wealth is more concentrated in a few countries in Africa compared to other continents. We will return to this point. But let's pick up again the earlier point about the minerals Africa produces in prominent quantities being less valuable compared to those that it does not produce. Take gold, one of the main jewels in Africa's crown. The total value of known reserves is roughly $2.6 trillion in May 2012's historically high prices. The total value of global gold production in 2011 at May 2012 prices is $138 billion. Africa's share of the reserve value of gold is $1.3 trillion. Its share of 2011 production value was $30 billion. Now, let's take iron ore, a mineral that Africa lags behind the world in both reserves and production. The total value of known reserves is roughly $128 trillion. The total value of 2011 production is roughly $475 billion, with the largest producer, China, bagging over $200 billion of this. China's share of reserves can be valued at nearly $4 trillion. Lastly, look at coal, a fuel mineral that accounts for about 50 percent of the value of all non-petroleum mineral production worldwide. Last year, $650 billion of the substance was produced. Africa's share of worldwide output of coal however totalled less than 4 percent. If these examples are generalised, one realises immediately that Africa's low production of the 'hard minerals' minerals most intensely used in industry compared to the less widely used 'soft minerals' reduces its total take from the global mineral trade. But it also makes a nonsense of fashionable policy prescriptions that emphasise import-substitution strategies based on value addition to minerals, rather than export competitiveness through smart trade strategy and the deepening of the financial system to support entrepreneurs. Furthermore, this is why one needs to be cautious when taking in information about Africa's reserve position in respect of some minerals. Take cobalt. Some commentators tend to use the fact that Africa produces nearly 60 percent of the world's cobalt as a perfect illustration of mineral wealth. Yet, the total value of cobalt consumed worldwide last year amounted to $380 million, meaning that Africa's earnings came to $228 million. Compare this to roughly $50 billion in value of Chilean copper production. This point is of course secondary to the more fundamental one made earlier: that Africa produces fewer minerals overall compared to the global average (in both per capita and per square mile terms), and that production is super-concentrated in a very few countries. Indeed, the residual value of Africa's mineral wealth is not only concentrated in a very few countries but also in a very narrow mineral base. For instance, South Africa has 92 percent of its reserve wealth concentrated in platinum group minerals, while at the same time it has 90 percent of Africa's coal and 95 percent of its chromium. Guinea mines 90 percent of Africa's bauxite. Congo mines 90 percent of the continent's chromium. Ghana and South Africa accounts for 60 percent of Africa's gold. South Africa, Gabon and Ghana produce virtually all the manganese. The state of affairs described above is compounded by the fact that Africa is witnessing a decline in the production of most minerals, such as gold, petroleum, and uranium, with new discoveries failing to offset falls in production in key countries. I put this point to a number of experts and economists during a conference in Addis Ababa recently. A major Ethiopian industrialist was of the opinion that a conspiracy may be afoot to marginalise Africa's mineral holdings. The truth though is that Geological survey data are composite, making use of information provided by local mineralogical agencies and international organisations. There is also another one strong reason why it is unlikely that reserve information in Africa is being 'gamed': investors. Investors have some incentive to mask production data to evade or avoid taxes, but they have just as much incentive to exaggerate reserve estimates in order to raise money. Indeed, nearly every single oil deposit discovered by mid-cap exploration companies in the gulf of Guinea in the past decade was significantly exaggerated upon find. I was also told that the continent's low mineral reserve base is due to the low intensity of exploration. In fact, I was pointed to a 2010 book by Professor Paul Collier in which he makes this exact point. Curiously, the concession is made to look like a belated acknowledgment based on new work. My 2007 comment on the subject for OhMyNews and a 2010 co-authored piece with Professor Lehmann of IMD however indicate clearly that Africa's relative resource-poverty is a fact that jumps up at even the casual observer cursorily browsing through geological survey data. In actual fact, Africa's mineral exploration intensity can be measured by the amount of exploration dollars Africa attracts. Fifteen percent of all global exploration capital is taken by Africa, higher than its per capita entitlement. It cannot therefore be true that the search for minerals in Africa, dating from colonial times, when colonial powers highlighted this resource and marginalised most others, has been patchy. If you are one of those relatively well-informed international executives and yet you find the message in this article perplexing and the conclusions novel, then you are justifying the original premise of this article: relying solely on stock wisdom, regardless of the source, can never match using primary data and first-hand research in effectiveness. Your business should benefit greatly from using as much primary data and as little stock wisdom as possible when and wherever critical aspects of the African economy are being examined to guide your entry strategy. Bright Simons is a Social Entrepreneur and Public Interest Researcher. He invented the mPedigree anti-fake drugs system (www.mPedigree.Net), and is a Fellow at IMANI, a think tank in Ghana. 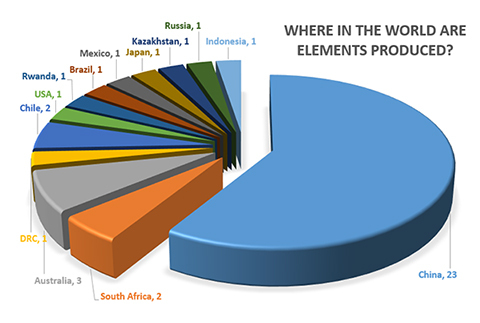 Figure 1: Chart indicates the number of times a country is the leading global producer of an element or element group of economic value.Source: BGS World Mineral Statistics. BGS©NERC. Click to enlarge.